Ancient peoples, from Britain to India, constructed marvellous structures of huge slabs, which are called dolmens. Dolmens belong to a group of ancient megaliths (in translation from Greek the word megalith means a “huge stone”) and represent man-made structures of a certain shape, assembled of massive stone slabs or blocks. These mystic structures, the estimated age of which is 2 to 7-8 thousand years old (sometimes the age of 10,000 years old is mentioned!) are spread all over the world, in different countries and cultures. 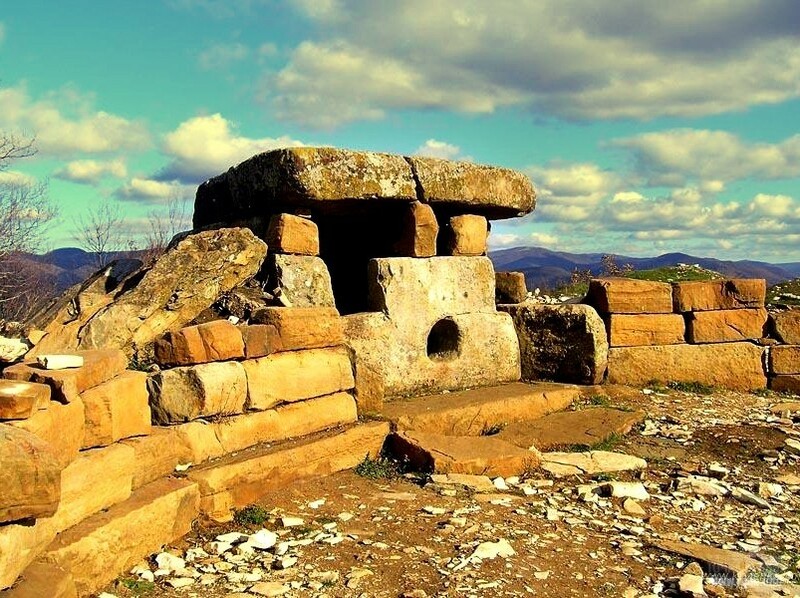 Some researchers believe the first dolmens were built on the Iberian Peninsula circa 4000-3500 BC. 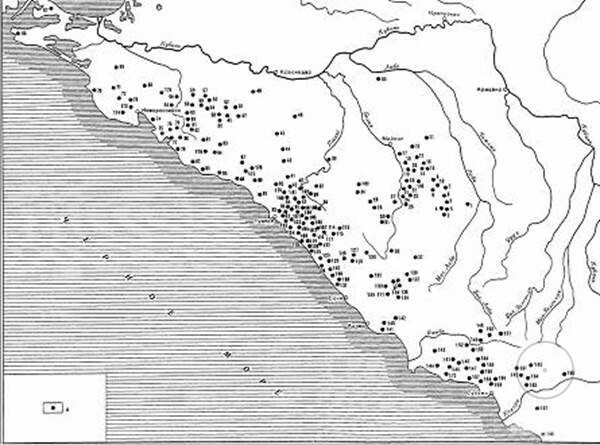 Others assert the earliest dolmen locations are the Baleares, Sardinia and Corsica. As of today, not less than 90,000 dolmens are numbered in the world. These structures are found in Bulgaria and Turkey, on the Mediterranean coast, Corsica and Malta islands, in Spain and Portugal. Many dolmens have been discovered in the territory of present-day England and France, and even on Polynesian islands. Such structures have also been found in North Africa (Roknia necropolis), India, Palestine and North Korea. 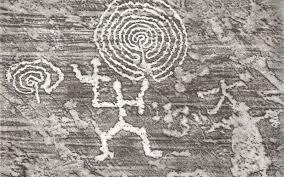 Over 50% of all dolmens found in the world are located on the KoreanPeninsula, and most of them are in Geochang, Hwasun and GanghwadoIsland. Before the war of 1950-1953 there were about 80,000 dolmens there, and not less than 30,000 have been preserved until today, but this surely does not prove that exactly Korea is the motherland of dolmens. 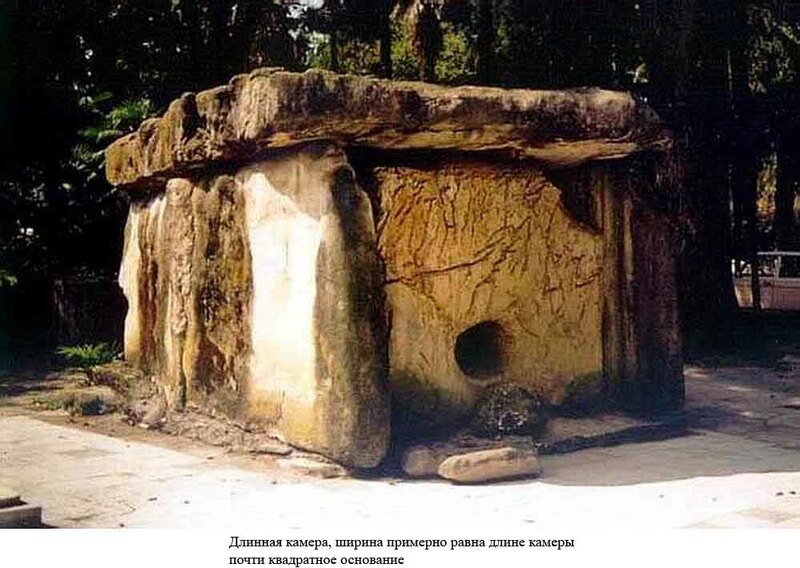 There is a big accumulation of dolmens along the Black Sea coast, especially in the Caucasus region where dolmens are scattered along 400 km of the coastline, from Anapa and Novorossiysk to Abkhazia. 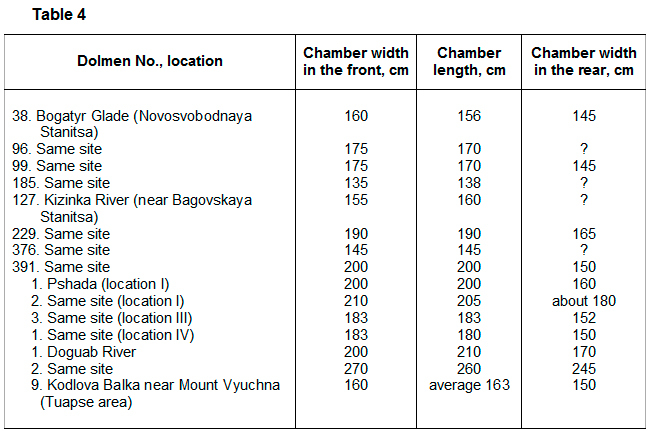 The width of this line towards Novorossiysk is 75 km, and as of today archaeologists have discovered about 3,000 dolmens here. 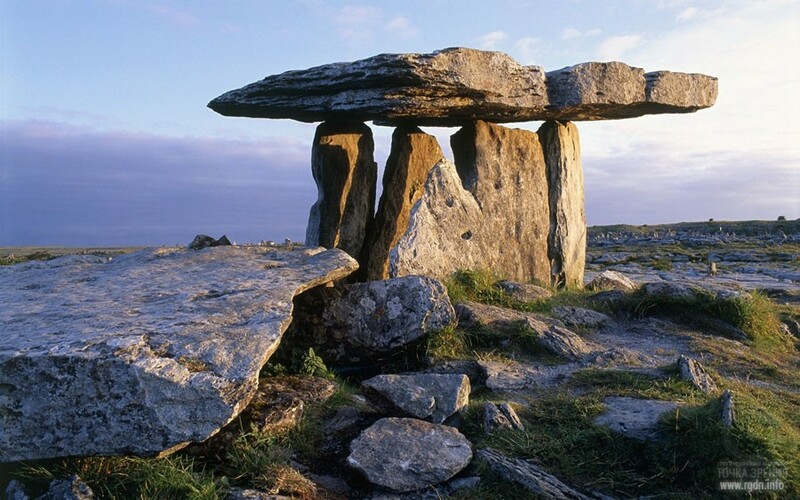 It is considered that the earliest dolmens were built here in the early 2nd millennium BC. Dolmens represent compositions of huge flat stone slabs, four of which are set vertically and covered with the fifth slab on the top. The weight of such “cover” may reach tens of tons, and it may be up to 10 metres in length and width. The further from the sea, the smaller such stone structures are. In the front slab there is a small oval or round aperture. The stone slabs of which dolmens are composed are almost untreated on the outside, while on the inside they are flattened and nearly polished. 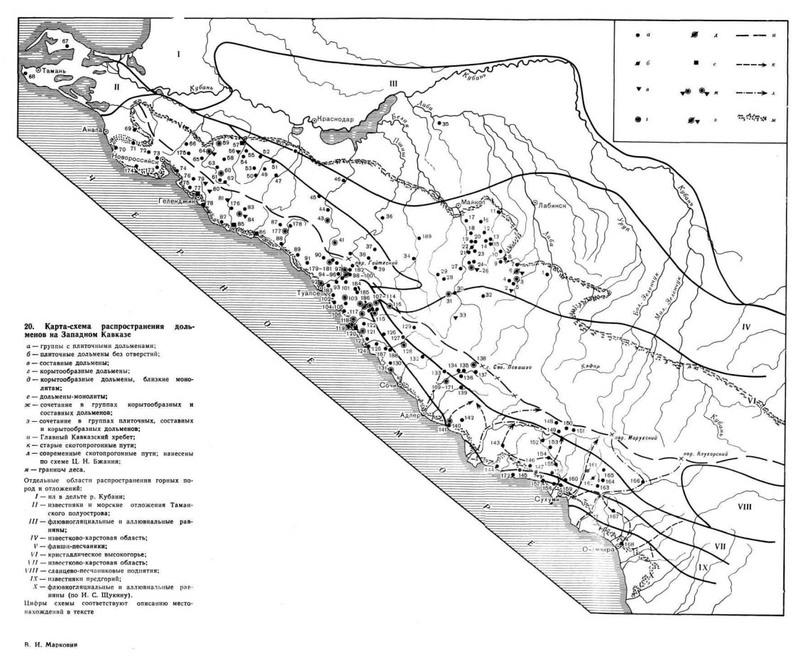 This is the map of dolmen locations in the Western Caucasus, presented by V.I. Markovin. Dolmen chambers are usually trapezoid or rectangular, or sometimes round. Such structures may be assembled of separate blocks or wholly hewed out of a huge stone. Some of them have ornaments carved on them, and relief images on front slabs. The shape of dolmens turns them into acoustic devices. Reflected from stone walls, sound vibrations get superimposed on each other, resound and swell (we will speak of this a little later). In Western Europe dolmens are assembled of untreated stones. In Russia such blocks are polished and thoroughly adjusted to one another. It is difficult to erect such a grandiose structure even by means of modern technologies. Another example of megalithic architecture is the so-called trilithons, or triliths (the name is formed of Greek words tri meaning “three” and lithos meaning “a stone”). These are mighty structures usually consisting of two huge vertical stone pillars on which there is the third horizontal large-tonnage block (in my opinion, it’s a dolmen variety). Just like dolmens, trilithons are geographically spread all over the planet. Regardless of location, the architectural features of trilithons are almost the same everywhere, which definitely indicates a common origin of their creators. A well-known example of trilithon architecture is Stonehenge in England, which consists of five separate trilithons surrounded with a circle of huge stones. They say Stonehenge was used as a sort of observatory. Here’s a little extra information. 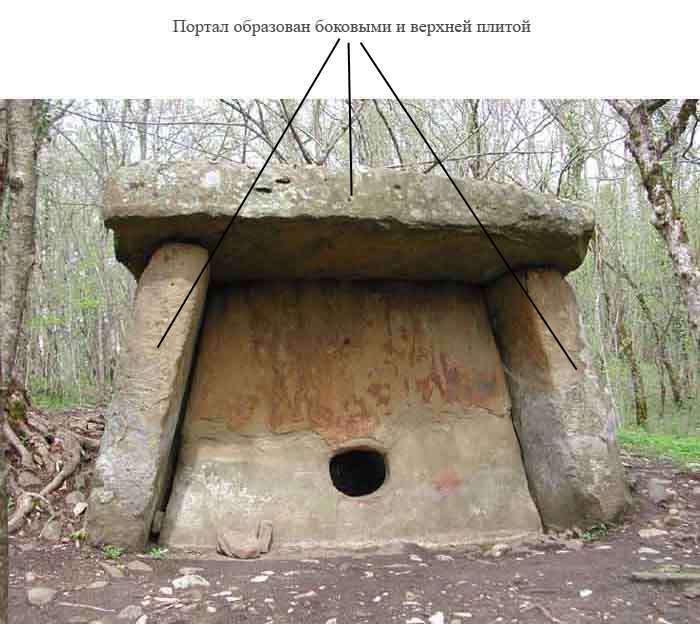 Dolmens in the Western Caucasus are megalithic tombs of the first half of the 3rd – second half of the 2nd millennium BC, belonging to the dolmen culture of the Middle Bronze Age. 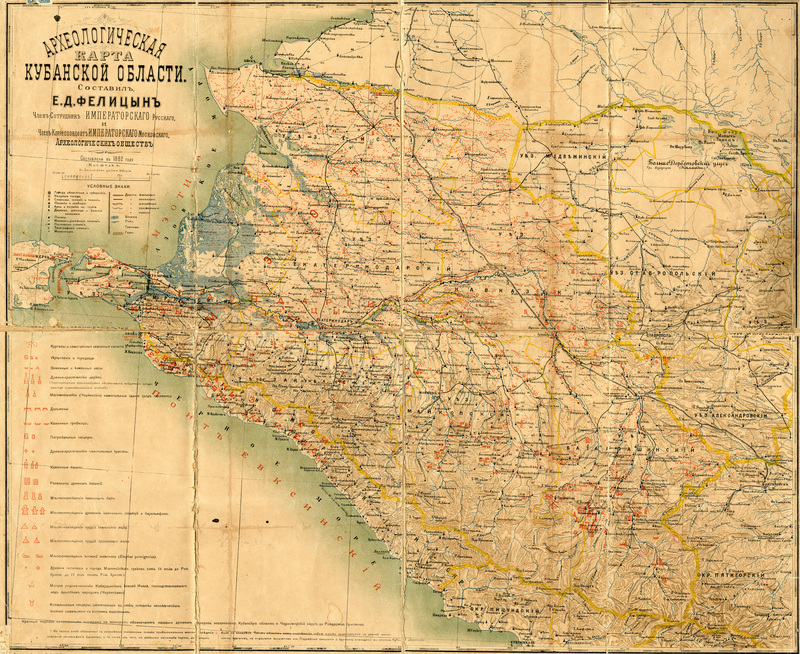 They are spread between the TamanPeninsula (Tuzla and Fantalov capes) and the mountainous areas of Krasnodar Krai and Adygea. 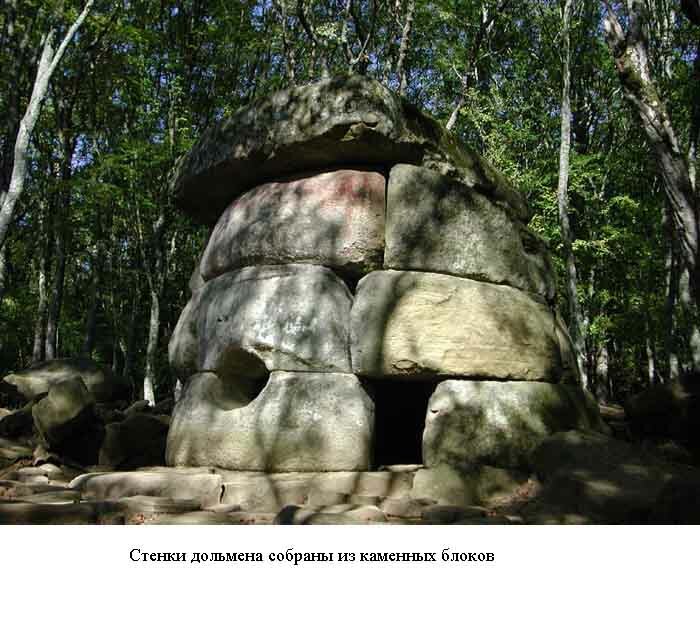 Dolmens are found down to the city of Ochamchire in Abkhazia in the south and up to the LabaRiver valley in the north, but earlier they were also located near the city of Zheleznovodsk in Stavropol Krai and possibly in other places. A separate exclusive region of location of later peculiar dolmens or “dolmen-like vaults” is Upper Prikuban (the KyafarRiver Basin in Karachai-Cherkess). 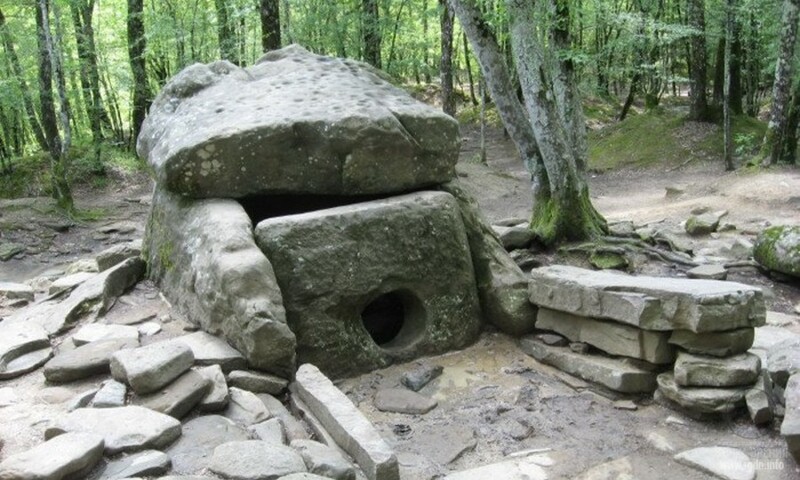 Dolmens continued to be used in the Late Bronze Age and even later. About 3,000 dolmens in all are known in these places, including ruined ones, and not more than 6% of them have been studied. Dolmens are mostly located in North Africa (Roknia necropolis), Western, Northern and Southern Europe. 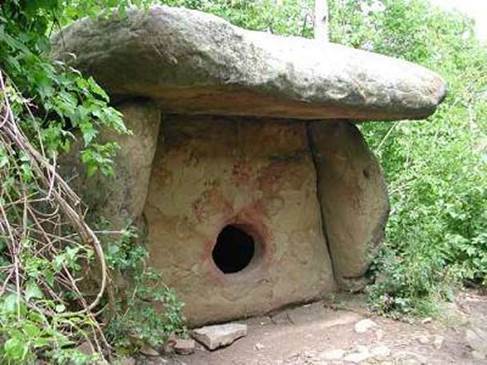 The greatest number of dolmens has been discovered in Korea (see dolmens in Geochang, Hwasun and Ganghwado Island). Before the war of 1950-1953 there were about 80,000 dolmens there, and not less than 30,000 have been preserved until today. In China there are about 50 dolmens in Zhèjiāng province and about 700 in Liaoning. Dolmen-like burial sites have been also discovered in Japan, mostly in the northwest Kyushu Island. 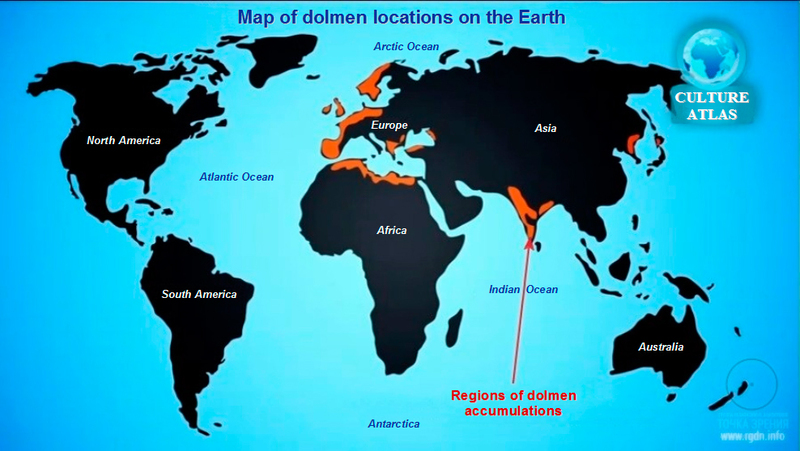 There are also dolmens in the countries of Southern and Southeast Asia: India, Indonesia, Taiwan, and Vietnam. 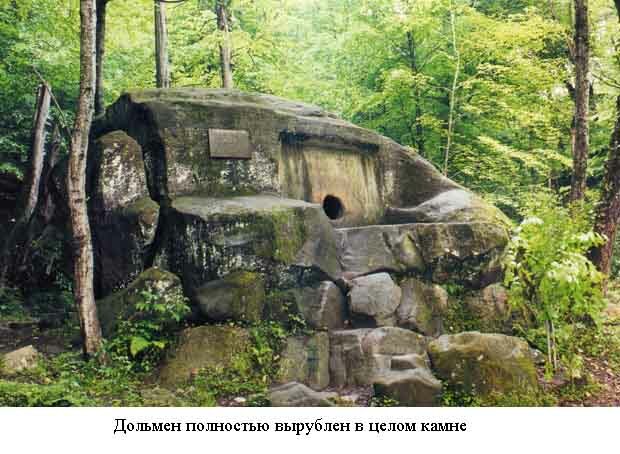 There are plenty of dolmens in Russia, namely in the Western Caucasus. Caucasian dolmens were created in the Early and Middle Bronze Ages in the 3-2nd millennia BC and were used until the 1st millennium BC. 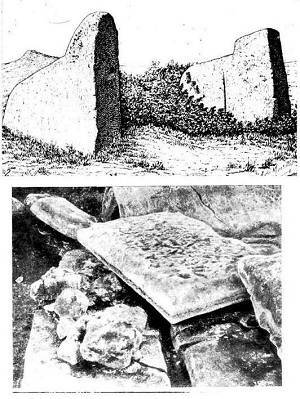 Moreover, megalithic structures have been discovered on VeraIsland in the southern Urals (Lake Turgoyak, Chelyabinsk Region). In Gamla reserve, Israel, there is Givat Bazak – the largest field of dolmens in the country with more than 700 dolmens on it. The area of the field is 3.5 square km. Ten of the dolmens were excavated by archaeologists, nine have proved to be empty, whereas in the tenth dolmen a skeleton with no head and left arm was found, oriented to the east (the skeleton dates back to the later time than the dolmen itself). Generally speaking, in the Middle Bronze Age dolmens were spread all over the Middle East, e.g. in Wadi Zarqa valley, Jordan. 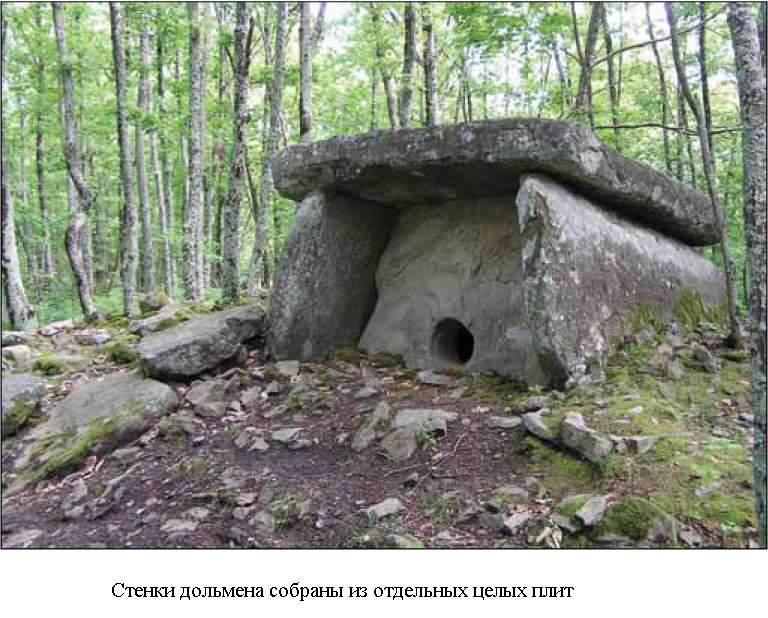 A megalith accumulation (dolmen site) is located in Kizinka River Valley, Russia. There are over 500 dolmens there, but unfortunately most of them are ruined and overgrown with greenery. There are numerous dolmens on the seacoast as well. 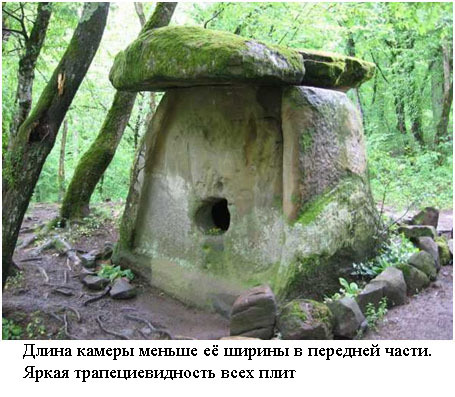 The most famous and easily accessible are dolmens in the valleys of Pshada and ZhaneRivers, on MountNexis (all in Gelendzhik District), in the suburbs of Tuapse, in Asha, and in the MamedCanyon (a monolith). 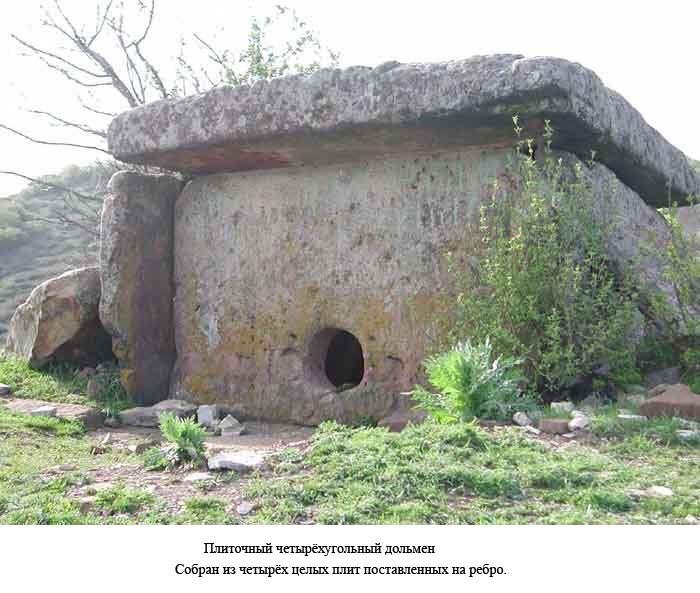 Free access to the dolmens is available in ShapsugVillage, in KizinkaValley, near Novy settlement, and in remote parts of Tuapse District. 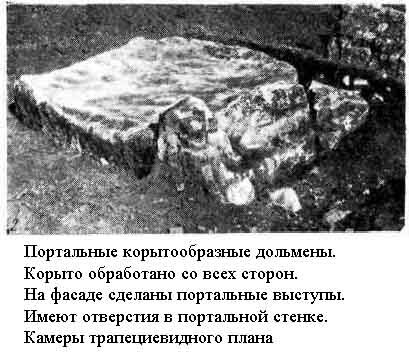 It is unknown who exactly discovered dolmens in Russia. Initial dolmen descriptions were given by representatives of various countries. 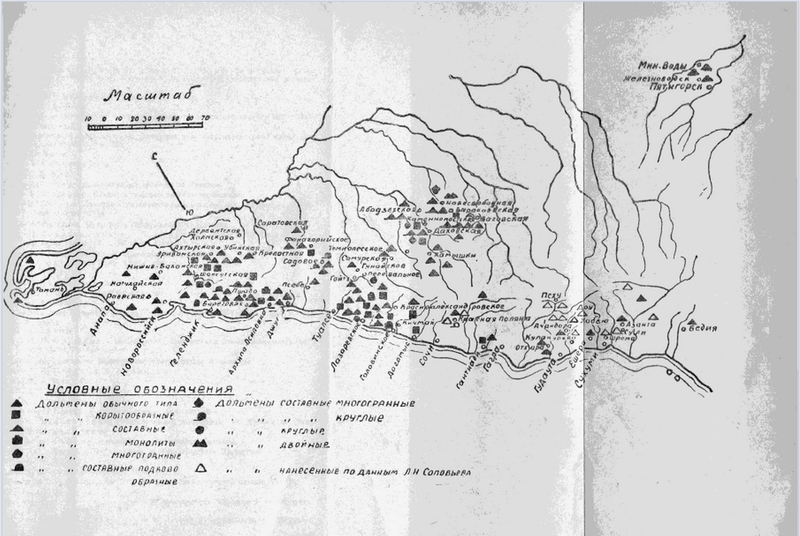 In 1794, German zoologist and botanist Peter Simon Pallas visited the TamanPeninsula and described the “stone houses” found there. 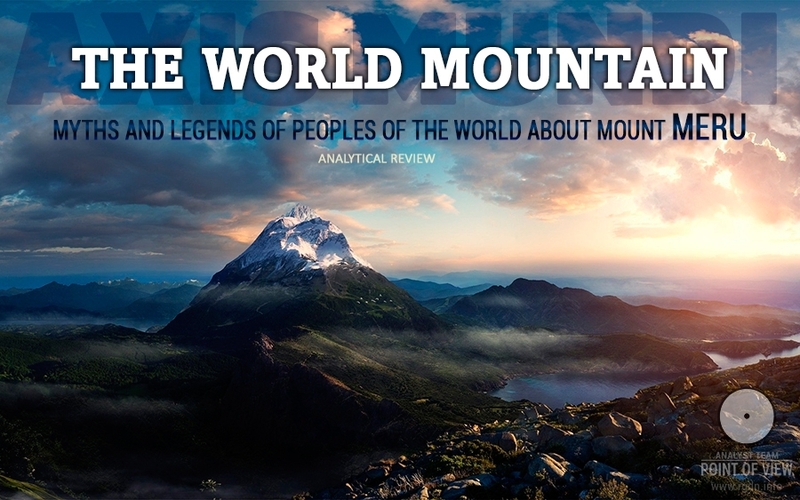 In 1818, the Frenchman E. Taitbout de Marigny, a sailor in the Russian service, made a written record of a group of 6 dolmens on PshadaRiver, and during the Caucasian War, in 1839 an English intelligence officer James Bell who lived among the Shapsugs drew picturesque sketches of mountaineers in front of dolmens. What does the word dolmen mean? Dolmens are usually called anta In Portugal and ryose in Scandinavia. These words are parts of local dolmen names. The Adyghes call Caucasian dolmens syrp-uns, which means “houses of dwarfs”. The Ossetians have a legend about a people of dwarfs – bicenta, who are endowed with supernatural features. For instance, a bicenta dwarf is able to knock down a big tree with his gaze only. Legend says the dwarfs live in the sea. The Ossetians assert that mythic Narts – the ancestors of Caucasian peoples – also came out of the sea and gave culture to people. V. Yashkardin describes this on his website in the following way: http://www.dopotopa.com/v_yashkardin_dolmeny_1.html. 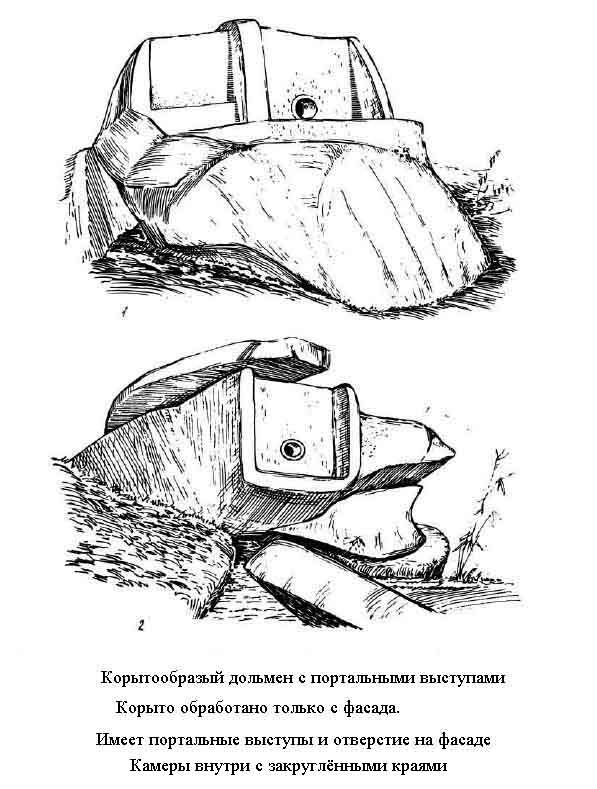 The word dolmen appeared in Russian archaeology after the 1840s. For instance, in 1879 Ye.D. 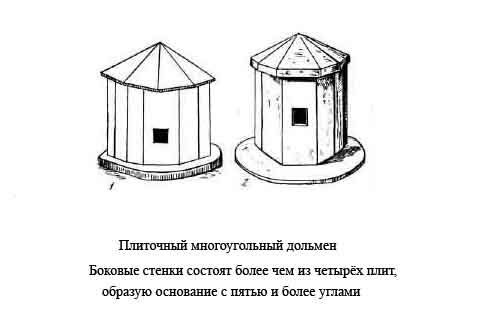 Felitsyn used the term долмен (dolmen) in his work, whereas in later works he switched to the word дольмен (dol’men). Other researchers, such as P.S. 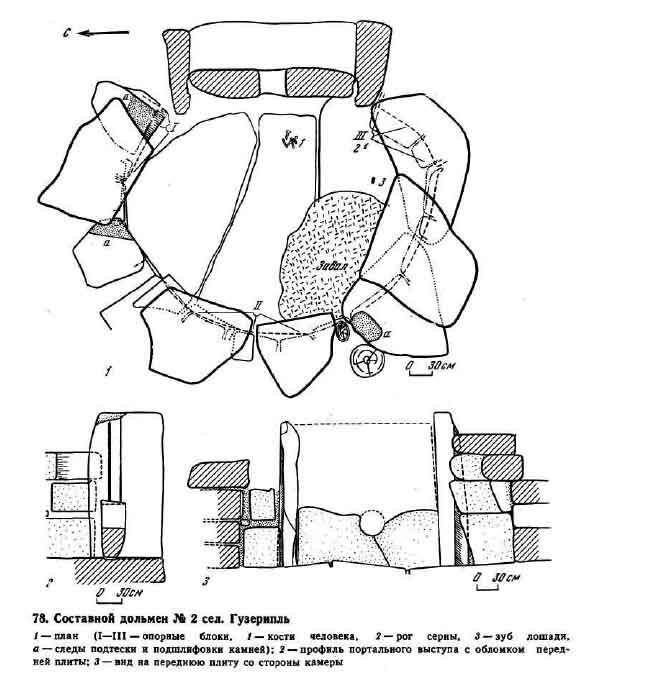 Pallas, E. Taitbout de Marigny, F. Dubois de Montpéreux, James S. Bell, etc., in their works earlier used the following terms to designate dolmens: Graber (tomb), Hugel (mound), de petits tumulus (little tumulus), coffres en pierres (stone box), pays maison (little house), tombeaux (tomb), tombe (tomb), and so on. 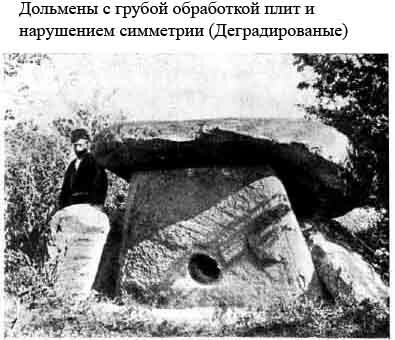 The first person in Russia who described the origin of the word dolmen was famous Russian archaeologist count A.S. Uvarov. In his work Megalithic Monuments in Russia he gave details of the history of this word. 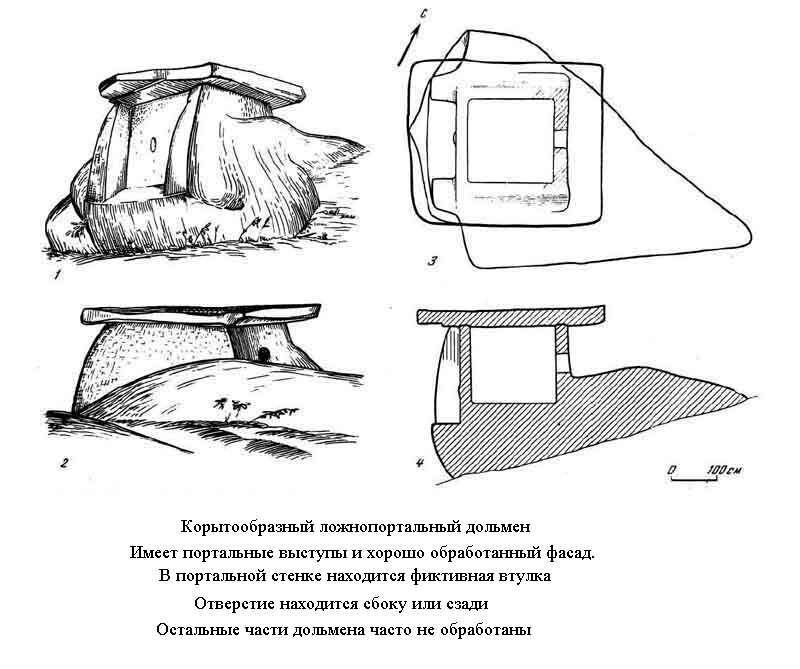 A.S. Uvarov asserts the word dolmen was invented by the French researcher Jean-François Bodin from the Celtic words tol (table) and men (stone). Jean-François remarkably tells about the megalithic monuments of Saumur: dolmens, kromlekhs, menhirs, etc. He confidently uses such terms without any explanation or their origin, calling so the ancient stone structures of the Celts. At that, we may assume Uvarov did not read Jean-François Bodin’s writings and only used critical information from encyclopaedias. 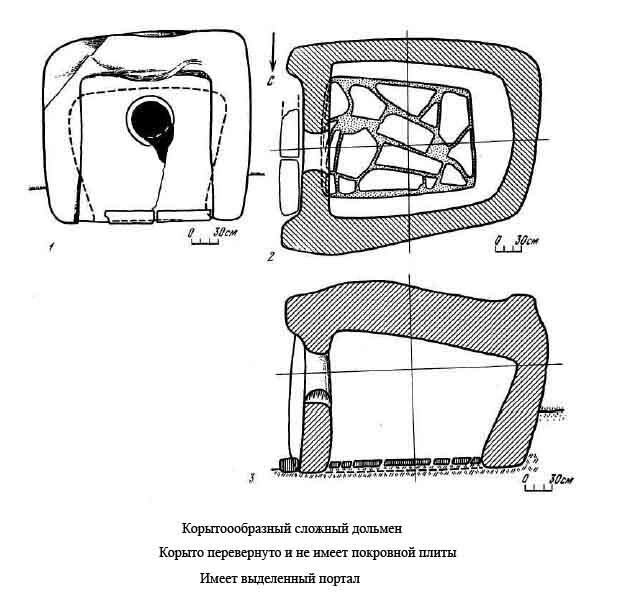 Since A.S. Uvarov was one of Russia’s major archaeologists of that time, his opinion is accepted a priori. For example, Ye.D. Felitsyn repeats the same story in his work, which is the basis of all further studies. To admit the wisdom of Russian and Soviet archaeologists, they don’t refer to Bodin in a critical or ironic manner. 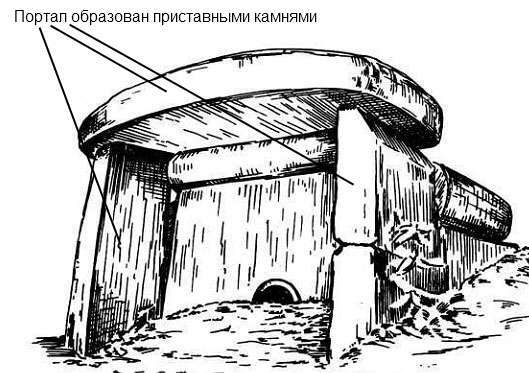 Leonid Lavrov does not mention tol-men (a stone table). 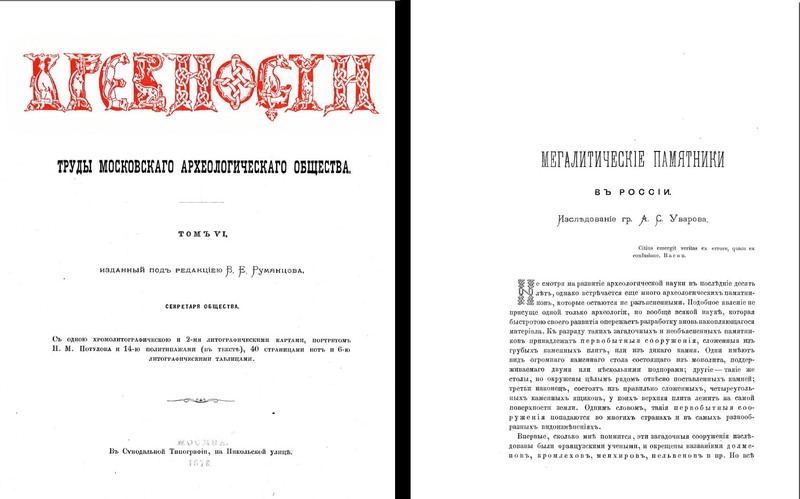 Vladimir Markovin in his major work on dolmens describes this term very carefully: he gives a reference to a French encyclopaedia of 1966, but dates the dolmen term to the late 18th century (so, this surely could not be Jean-François Bodin). Now, let’s explain V.I. Markovin’s words about the late 18th century. 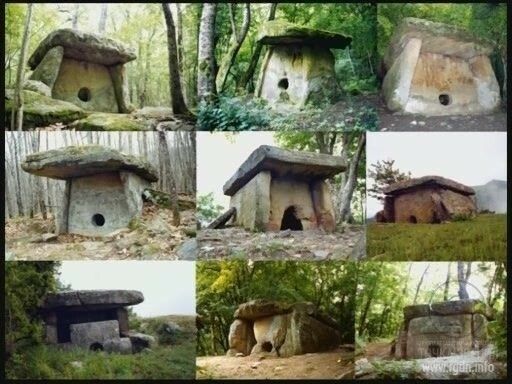 The word dolmen was already used in works by French researchers of that time: Pierre Jean-Baptiste Legrand d'Aussy (1737-1800), Théophile Malo Corret de la Tour d'Auvergne (1743-1800). Particular attention should be paid to the book Origines gauloises (The Gallic Origin) (1792) by the famous “Celt culture lover” (short story collector) Théophile Malo Corret, where he determines the word dolmen as an ancient name of the upper stone in a Gallic sanctuary. Hence, it becomes clear that the name dolmen or dolmin is of ancient origin. As for the “stone table” (tol-men), the story is even more tangled and senseless. According to the British and French Wikipedia, etymologists cast doubt on such hypothesis. In Celtic, tol-men means a stone circle, not a stone table, although the two notions are close for the Celts. There is no tol-men in English and French, therefore the Celtic language is mentioned. The word designates that what bears its sonic image and does not depend on the date of its creation. All other (local) dolmen names are less ancient (in my opinion), and such stone structures were never called so in the primary sources. 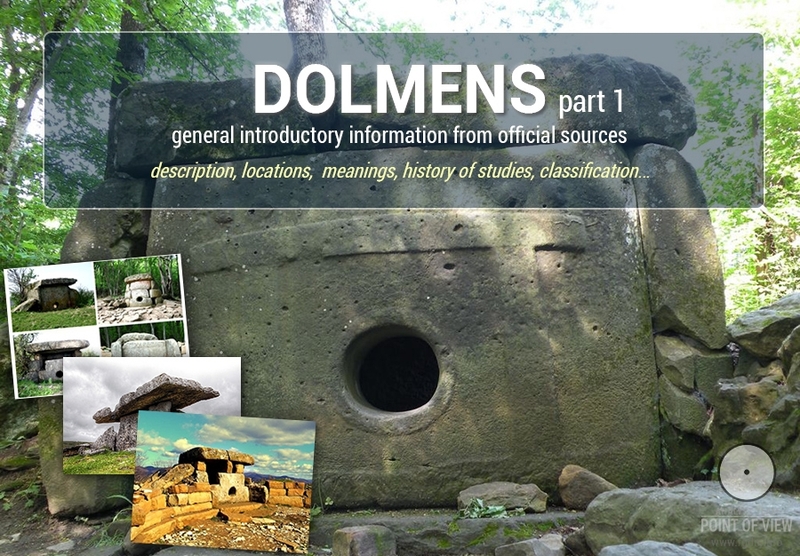 We can see that many who called dolmens in such a way had no idea what dolmens actually represented. Houses of dwarfs or giants, tables... In a similar manner we could define pyramid as a “heap of stones” and say it’s an ancient name. In Google Translate, there are pronunciations of words in any language. Listen to the word PYRAMID: in all languages it sounds quite the same, though being written differently. Words sound identically in all languages only if they were created in the general information space of the Earth. For instance, there is a Russian word sputnik (satellite) created in the 20th century and meaning “co-traveller”, “travelling along”. 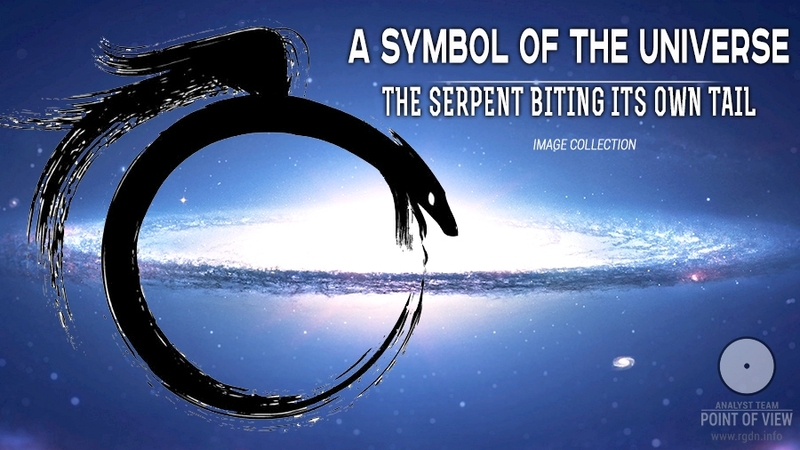 The sound image of this word designates its essence, and it sounds similarly all over the world. Thus, the word pyramid was created in the general information space of the Earth, which existed before Christ. The word sounded in the same way before the Flood and when the pyramids were constructed (in his works Herodotus already called them pyramids, while he lived before Christ). Perhaps, the word dolmen, just like pyramid, came to us from the previous civilization, and this is still to be ascertained. Quite possibly, the people of our civilization who lived near dolmens did not build them, and some even feared such structures. For example, the Adyghes called dolmens ISPUNs (“coming from what frightens us”). Since this article is mostly introductory, I believe it is better here to pay more attention to the general principles and the actual purpose of dolmen construction. 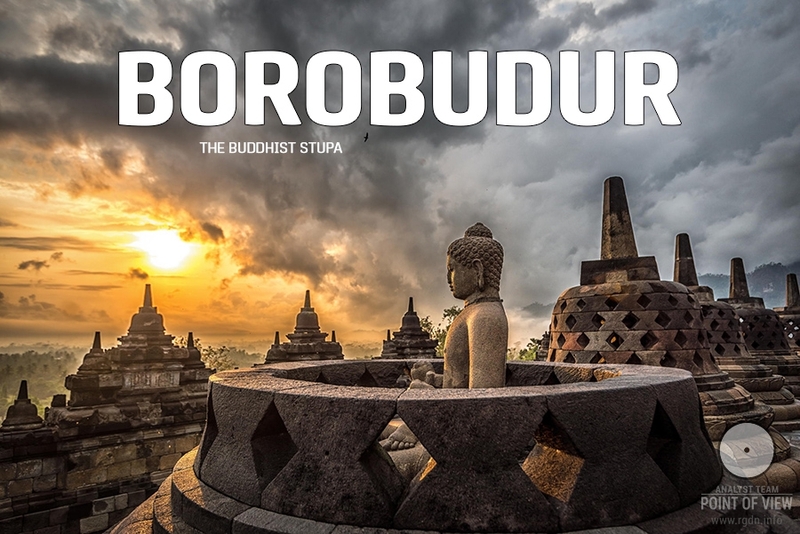 Link: http://softelectro.ru/dolmen_his.html. 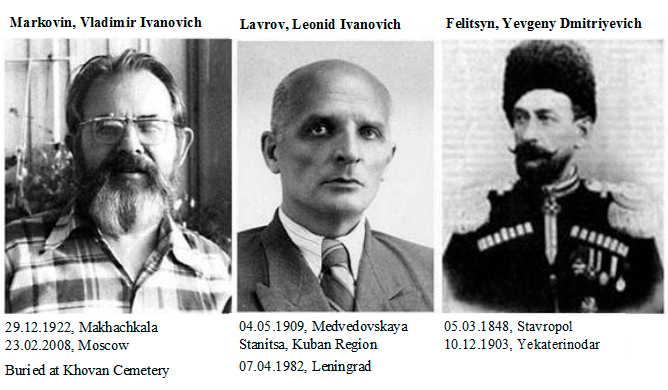 The three most famous dolmen researchers in Russia should be mentioned particularly. 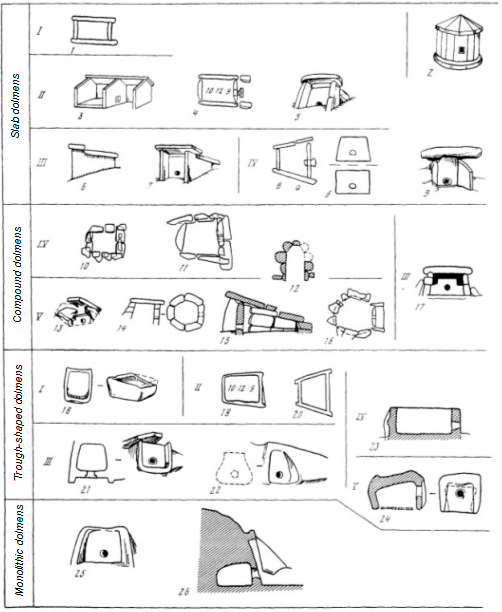 Dolmen classification suggested by L.I. Lavrov and extended by V.I. Markovin. Includes dolmen types, shapes, versions and varieties. 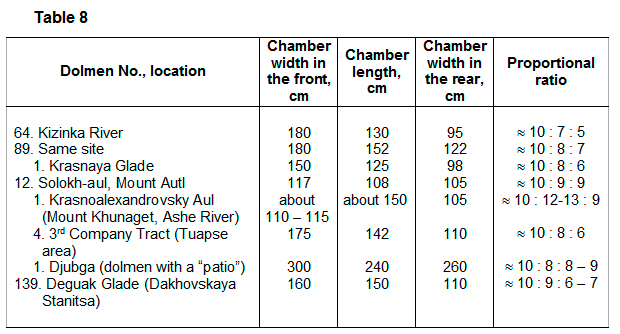 Below there is a table of dolmens by types and varieties, as suggested by V.I. Markovin. Now, let us proceed to the dolmen design. 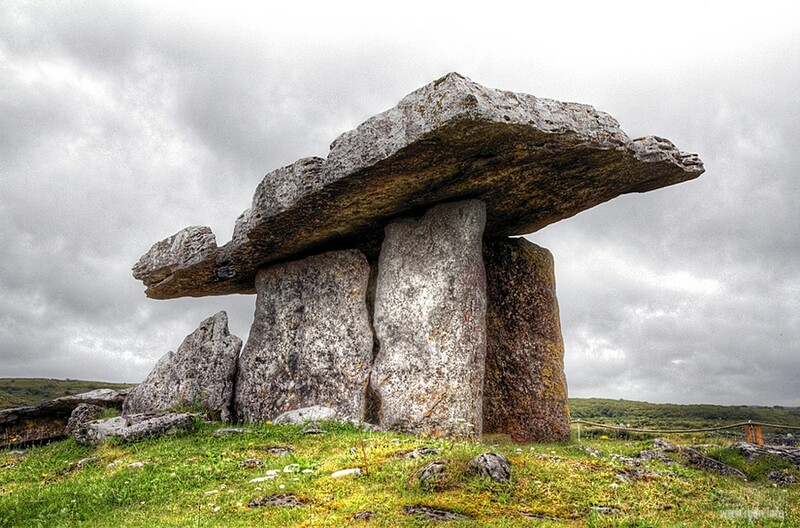 Dolmens represent planned architectural structures, where “symmetry, centre and rhythm” are clearly noticeable. Such criteria are intrinsic to present-day architectural projects. 1. Dolmens are placed at different levels relative to the ground: they may be open, lowered into the ground, deeply lowered, or buried in mounds. 2. 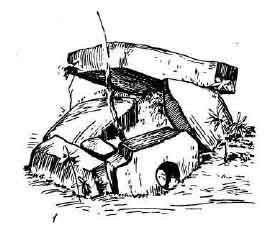 A dolmen may be placed on a stone embankment, on a slab bedding (floor), on separate stones (heel stones), on the ground, or may be dug into the ground. 3. Dolmens are often placed in rows on a common embankment. 4. They are placed on a levelled ground, which is especially noticeable on slopes. 5. Dolmens are usually located on elevations, 250 to 400 m above sea level, less frequently 400 to 800 m, but sometimes even higher than 800 m above sea level. 6. They are widespread in hardly accessible mountainous and wooded areas. 7. Dolmens may be placed in groups or be solitary. 8. They are usually placed with the aperture-bearing front slab oriented towards a river (down the slope), with the prevailing southeast or south azimuth. 1. Dolmens represent stone boxes of diverse configurations, beginning with rectangular and up to round ones, with a large overhead slab (stone). 2. It is a very durable structure. 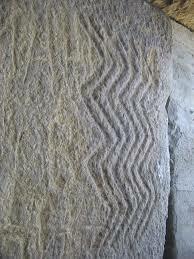 Grooves were often carved in stones in order to ensure solid fastening of stone slabs between one another. 3. There is an aperture closable with a plug. At that, there are dolmens with no apertures at all. 4. On the four sides before the front transverse slab there are portals – stone juts. 5. The front transverse slab often has a bulge in the middle (a cylindrical lens) or sometimes a swelling (in semi-monoliths). 6. Dolmens are notable for symmetry and dimension multiples. There are several dolmen dimension types, i.e. there is a dimension range. 7. Inner surfaces of the slabs are usually flattened or polished. 8. 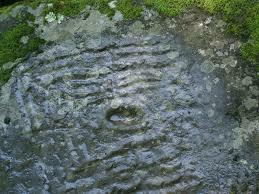 Sometimes there are zigzag or spiral scratched lines on dolmens “walls”. 9. Sometimes there are carved stone hemispheres jutting out of the transverse slab. 10. Local stones were usually used for construction of dolmens: sandstone (small-grained, dense, with no major inclusions), dense limestone, or tuff. 11. Some dolmens, kromlekhs and menhirs stand on round artificial banks which make them kindred to underground cupola tombs. 12. Sometimes dolmens have “buttresses” that support the side slabs. The overhead slab is often too large and heavy (the largest one found weighs 22.5 tons). It obviously served not only as a dolmen roof or overhead cover. Sometimes its weight exceeds the weight of all other dolmen parts together. It is not logical to build houses or tombs where the roof is heavier than the house or tomb itself. They trimmed and polished overhead slabs at the bottom and on the sides only. To ensure solid fastening with the chamber slabs they punched grooves in the overhead slabs. The front slab has the shape of a stone lens and can focus sounds. What else but focusing may explain such a shape? 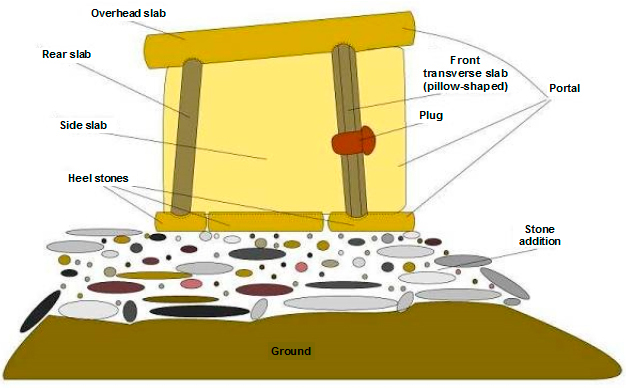 Front dolmen slabs are pillow-shaped and gradually thicken towards the middle. In some structures such a bulge is the most protruding on the side directed inside the chamber. Side edges of front slabs are thoroughly polished and sharpened on the top towards the inside. 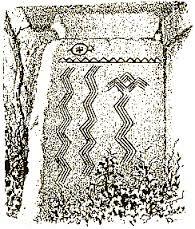 In most dolmens front slabs have marked mirror symmetry. As a rule, if their sides were divided along a vertical axis, they would match quite accurately, possessing compatibly equal parts. The apertures (the manhole) in the front slab are also divisible by an axis of symmetry into two equal halves. ... In early dolmens, apertures are located quite low: at the height of not more than the aperture diameter from the lower edge of the front slab. In later monuments, apertures were carved higher, but never higher than the slab middle. 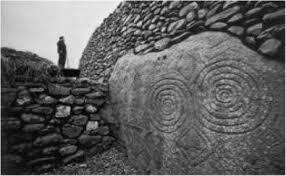 The front slab with an aperture and a portal is called the dolmen “façade” or face. Dolmen façades are always directed to the area descent (down the slope). Dolmen façades are always directed towards the area descent, i.e. to a nearby river. Such orientation is adhered to rather strictly. Attempts of some authors to link such orientation to cardinal directions have proved to be groundless. Let me note that alternative hypotheses of the dolmen purpose pay little attention to the aforesaid fact, although it is fundamental. Why are dolmens always oriented to a waterbody? Stone plugs were tightly inserted into the aperture of the front transverse slab. A deepened edging was sometimes carved around the aperture. Plugs had various shapes and lengths. The size of the plug aperture was quite standard and fell within the range of 0.3 to 0.45 m. The plug length could sometimes reach 1 metre, which significantly exceeded the slab width. Long plugs of 0.7-1 m are the most intriguing. Why did the ancients make plugs of such a length? Moreover, why did they sometimes carve a stone hemisphere instead of a plug? Some researchers associate plugs with the cult of phallic stones. However, this may apply to round plugs only, while plugs had diverse shapes, including square, trapezoid, semicircular, etc. It’s very problematic to lift such a plug. The rear slab in dolmens is flat, i.e. no pillow-shaped. The side directed inside the chamber is flattened and polished. The slab top and bottom are inserted into grooves of the overhead slab and the heel stone. Why did they polish slabs inside the chamber only? These slabs are most often close to rectangular, although there are trapezoid ones, too. There are also slabs with a raised front part which forms a portal. Side slabs are always well polished on the side oriented to the chamber. Upper edges and sometimes side edges are somewhat cut (the skewed face is taken off), forming a dihedral bend. Side slabs may be untreated on the outside and have a salient shape. What was the purpose of such a special stone portal in front of the dolmen façade? 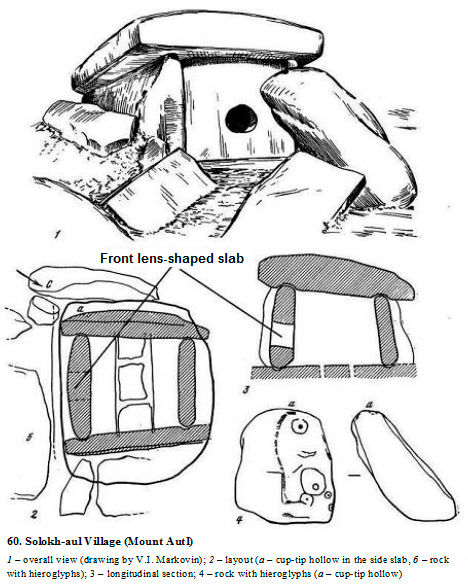 Heel stones served as the dolmen support, and had chutes and grooves for fastening side and transverse slabs. The protruding front part of a heel stone served as the portal lower slab. Heel stones served as a support for the entire structure and were placed on the subsoil. They were made of elongated bars that were slightly treated, and upper sides of them were polished. In most cases the dolmen façade was supported by a single massive heel stone, though sometimes such support was made of 2 to 3 blocks placed next to each other. Such stone or stones formed a sort of foundation for the dolmen and at the same time served as a portal ground before its façade. 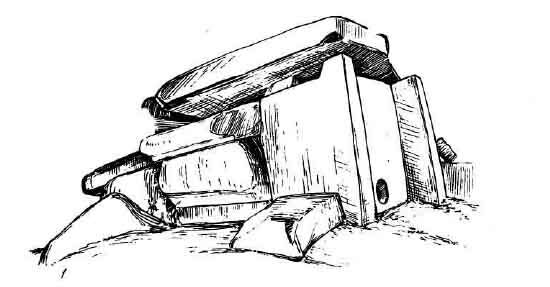 In the age of mass construction of dolmens, heel stones were placed under all chamber slabs, while inside the dolmen there remained an empty space between the slabs (a “box” as Ye.D. Felitsyn called it). Other heel stones closed up inside the chamber, forming a nice smooth floor. In the stones laid under front and rear slabs they carved longitudinal chutes and grooves into which lower edges of the slabs were inserted. Why the flutes were so precisely shaped and adjusted to the dolmen front slabs??? 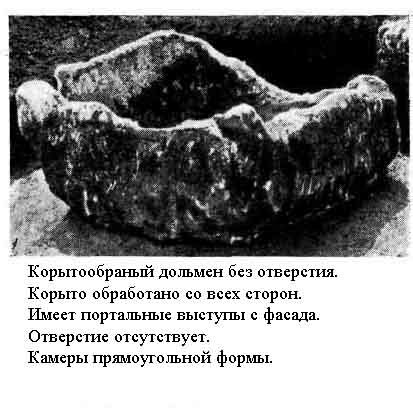 Slab dolmens, Type 1, Version 1 (no apertures): approximately 10/10/10, about 11 dolmens in total. 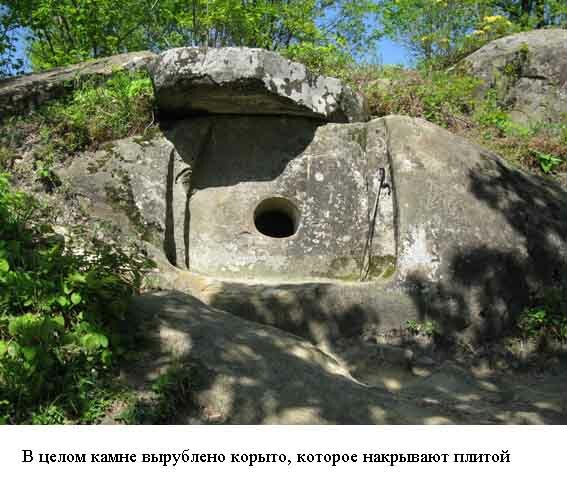 Slab dolmens, Type 1, Version 2 (portal): 10/12/8, 10/12/9, about 48 dolmens in total. 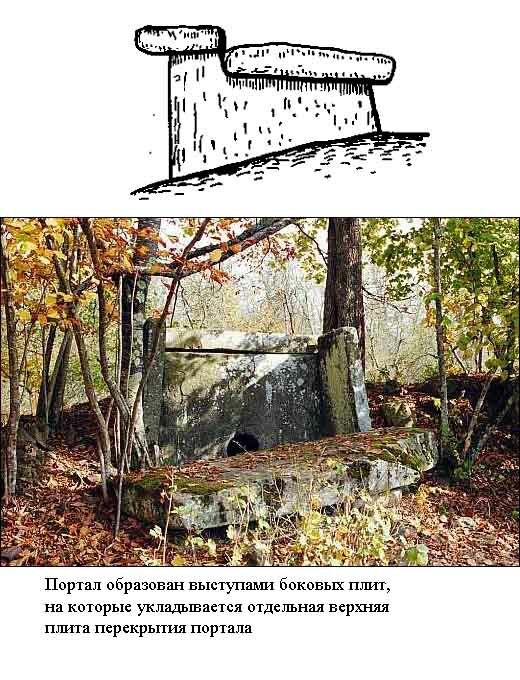 Slab dolmens, Type 1, Version 4, Variety 3 (false portal, simplified): 10/8/7, 10/8/6; the pattern is poorly studied. 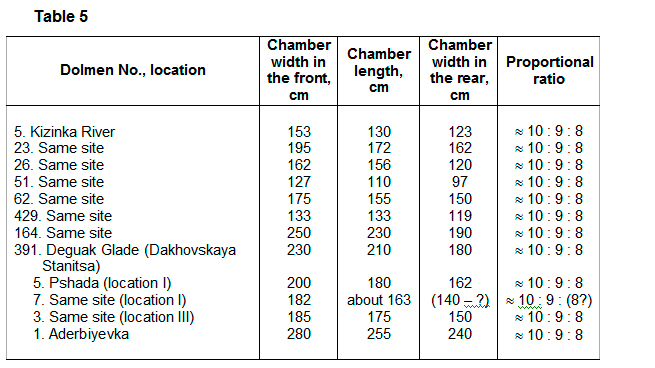 Thus, there are several groups of dolmens with a characteristic chamber length-width ratio. 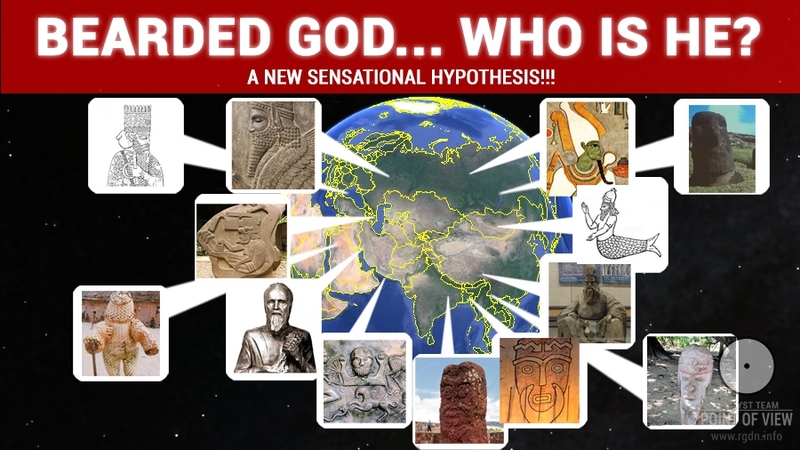 An official or alternative hypothesis should explain such a typical character of the dolmen side correlation. Why were dolmens built with a given correlation of sides? Plane grounds exceeding the dolmen foundation dimensions were arranged. It is necessary to explain the purpose of such grounds, since it was totally sufficient to flatten the ground under the dolmen to ensure steadiness. Researchers of Caucasian dolmens generally paid no attention to the indispensable presence of a plane ground in front of the dolmen façade. Only A.F. Leschenko mentions such grounds. At the same time, the ground is obviously there in all dolmens I know. If a dolmen stands on a flat surface, the role of such a ground was played by an open space adjoining the façade. In such cases it was difficult to notice the ground. But if a dolmen stands on a mountain slope, the ground stares in the face. 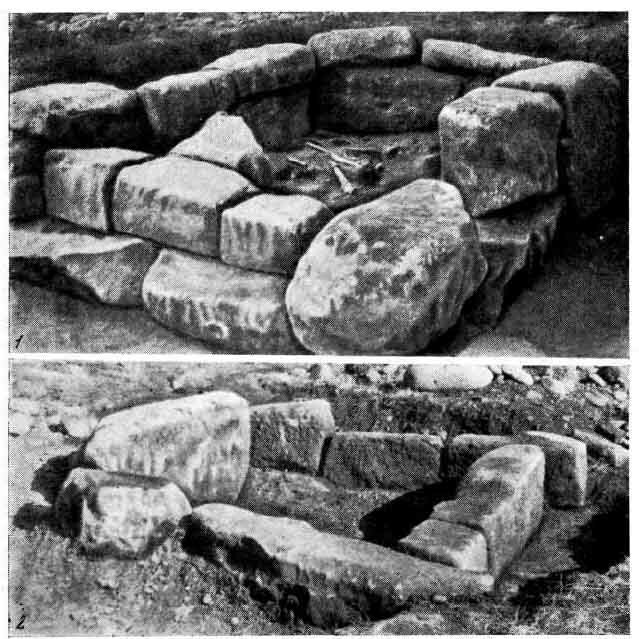 In such cases there is a natural or artificial little flat space in front of the façade, whereas right behind the dolmen rear slab a steep slope rises. 9 dolmens are known, where the ground in front of the façade is enclosed by menhirs, whereas 1 dolmen (in DjubgaVillage) is enclosed by a fence of big hewed stone blocks. 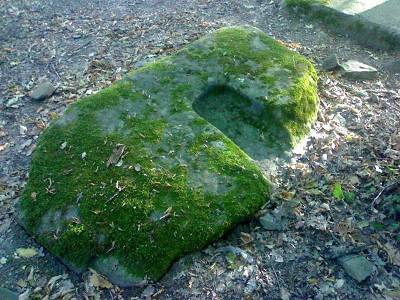 The ground before a monolithic dolmen on GodlikRiver (2.5 х 2.5 m) was hewed in the same stone as the dolmen itself, and, being aligned with the dolmen floor, it is 3 m above the earth. Why were plane grounds made in front of dolmen façades and aligned with the dolmen floor? Any hypothesis on the dolmen purpose should provide simple and clear answers to the questions put above, without any strained interpretations and verbiages (e.g. “they wanted so”, “they thought, but in actual fact...”, and so on).